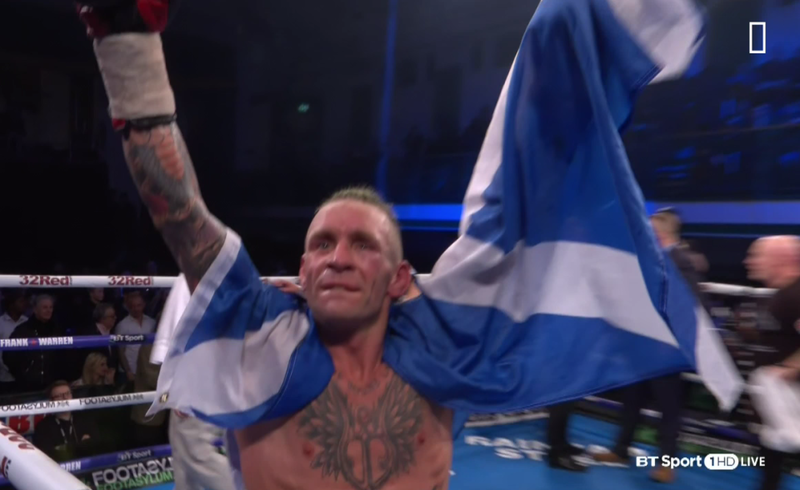 Scotland’s Ronnie Clark, a 14/1 underdog entered the ring against undefeated and the highly talented Zelfa Barrett at York Hall, Bethnal Green. Not many gave the Dundee fighter a chance of pulling off an upset against the Manchester favourite. ‘The Shark’ showed a lot of bite and produced a solid performance. The 33-year-old won the hearts of the fans inside the arena as he defeated Barrett with an impressive dogged display. Clark hasn’t had life easy and he didn’t need any added incentive to prove doubters wrong. “It’s really difficult unless you’re an Olympian, won a gold medal at the Olympics, fought at the Olympics or won the Commonwealth Games – unless you had some kind of achievement in boxing. You’re never really seen as anything, it’s been quite a hard road for me. “I’ve always worked hard and taken fights but it’s always been last minute. I said at the start of this year ‘I’m going to give 100 percent’. I’m going to work really hard in the gym and when I get that last minute phone call, I’m just going to know where I’m at – that’s exactly what I done. “It frustrates you, of course, the way an away fighter is treated in boxing. But, what do you have to do to change that? I don’t know! Clark took the fight at 18 day’s notice. Ricky Hatton claimed promoters such as Eddie Hearn do this deliberately to give their fighters maximum advantage. “I know that’s the case, 100 percent. They gave me 18 day’s notice and they were hanging about with the contract. “It wasn’t just a straight ‘do you want to fight so and so?’ I don’t say ‘what weight or how much am I getting paid?’ I just say ‘yeah, lets fight’ that’s the way I’ve always been. Barrett was caught by a clever well-timed uppercut in round six and you will struggle to see a better uppercut this year. Remarkably Barrett managed to pick himself back up and continue. “It was a nice shot. It was a nice timed shot. When I said it was the best shot of my, thinking back it was nowhere near the best shot of my career. I’ve competed in contact sport since I was seven-years-old. I’ve had so many kick boxing fights, I can’t even remember how many. I know I have landed better shots than that. With both fighters making it to the final bell, it went to the scorecards. Both fighters waited for the result in the centre of the ring and the first card was read out 114-114, a draw. “Obviously the first judge scored it 114-114 which was Michael Alexander, a British Judge. “I know that judges and referees are influenced by promoters. I knew the fight was never 114-114. When the second judge read out 116-111 – I knew I had won the fight. I knew I had been beaten in rounds but I didn’t think he won 116-111 and I thought that was what they were applying. “I thought I was getting robbed, yeah – I really did. I thought that was me pretty much getting bent over and shafted up the back end again [laughs]. “It’s a really hard sport. I’ve already said if I lost the fight and the referee gave me the win, I would openly say ‘I lost the fight and I never won that fight. I’m sorry, let’s get the rematch on‘. “Obviously straight after the fight they think I’ve fluked it and there wanting the rematch. I’m hurt and I know the guy has ambition, he’s doing well and I know he’s a really good boxer. “I know where I’m at and I know there’s nothing he can do to beat me. There’s nothing, not a thing he can do to beat me. In the super featherweight division at the moment I’m a really strong contender. I’m ready and I’m prepared and that’s the best part of me. “Do they think they’re going to come out and box me in the rematch? That won’t be the case. I know 100 percent he can’t outbox me. In the eleventh and twelfth round he knew he had to stop me and I stayed in there. When I was boxing him, I was beating and boxing him. “I want to fight for everything, every belt possible, every bit of bling and I want every belt around my waist. “I want to give the fans real fights and fights they deserve. Sam Bowen is doing really well and likewise Maxi Hughes. I drew with Hughes early in my career it would be great for us to get back in the ring. Maxi’s doing well and Sam Bowen’s doing well – it’s a fight the fans deserve to see. “They say boxing is a business and I understand it’s a business, but it’s not a business for me. When I fought Martin J Ward straight after the fight I wanted the rematch and they said they had nothing to prove. And now with Zelfa Barrett, I’ve nothing to prove. They’re wanting this rematch I’m more than happily give them this rematch – it’s a shame they’re going to ruin the boy’s career. A source close to Ringnews24 revealed the rematch will happen with the date likely to be June 2 in Manchester. Clark doesn’t want to think about defeat and he doesn’t think there is any risk involved in the rematch. “It’s not a risk for me, not at all. I know we have corruption in the sport. They might have Stevie Wonder judging this fight, I’m not sure if he has his judge’s licence. “It’s boxing you never know who is going to be shipped in – they might have Zelfa Barrett’s uncle on one of the judges tables. Clark revealed there was no rematch clause prior to the fight. Clark will have a full training camp this time around and is looking to take full advantage. “To be in as many real fights as possible.